The success of Yu Ziyang in opposition to Korea Republic’s Jang Woojin was very much the performance that attracted the attention, as play concluded in the group stage of proceeding on Wednesday 24th July in the Men’s Singles qualification tournament, for places in the Seamaster 2018 ITTF World Tour Platinum Australian Open in Geelong. However, he was not the only aspiring young Chinese player trying to make mark and challenge for national team honours who upset the order of merit and secured a group top spot. In addition, colleagues Liu Dingshuo and Zhou Yu both emulated Yu Ziyang. 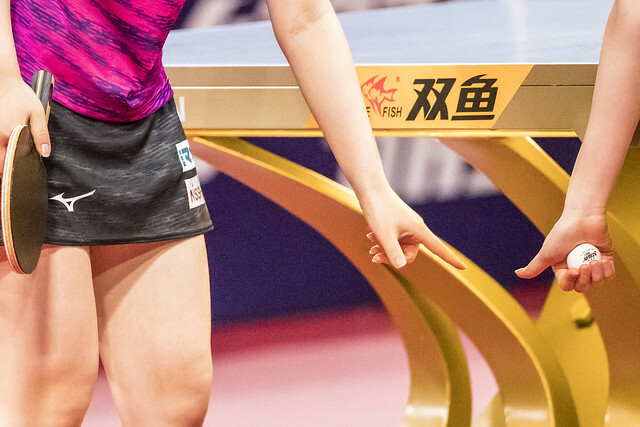 They concluded their group phase matches unbeaten and thus in first place; different to Yu Ziyang, they succeeded without the need for a deciding seventh game. Yu Ziyang had been extended the full distance by Jang Woojin (8-11, 13-11, 12-10, 6-11, 13-11, 8-11, 11-9); for Liu Dingshuo it was a four straight games success against Chinese Taipei’s Liao Cheng-Ting (11-7, 11-7, 11-9, 12-10), for Zhou Yu, a six games win in opposition to India’s Harmeet Desai (12-10, 7-11, 11-5, 11-2, 8-11, 11-4). Wins against the top rated player in the group to secure pole position; it was the same Belgium’s Florent Lambiet and Croatia’s Tomislav Pucar, as it was for the Japanese duo of Yuki Hirano and Yukiya Uda. Yuki Hirano, the younger brother of Sayaka Hirano, beat Germany’s Benedikt Duda (7-11, 11-9, 11-9, 11-8, 11-6), Yukiya Uda accounted for Singapore’s Gao Ning (11-8, 11-9, 11-8, 11-7). Similarly, Florent Lambiet defeated Sweden’s Anton Källberg (11-9, 14-12, 11-6, 8-11, 9-11, 13-11), Tomislav Pucar ended the hopes of Poland’s Jakub Dyjas (11-9, 6-11, 11-8, 11-8, 11-6). Somewhat surprise outcomes but with the exceptions of Jang Woojin and Benedikt Duda for the leading names required to raise their rackets in anger as the group stage ended, it was success. Chinese Taipei’s Chen Chien-An beat the host nation’s Kane Townsend (10-12, 5-11, 11-13, 11-2, 11-7, 11-5), Japan’s Yuya Oshima overcame Korea Republic’s An Jaehyun in tense seven games duel (11-7, 11-13, 7-11, 4-11, 11-8, 11-1, 11-9); whilst, like Chen Chien-An, India’s Sathiyan Gnanasekaran halted host nation aspirations. He accounted for Heming Hu (11-5, 11-2, 11-8, 11-7). Players finishing in first places in groups numbered one to ten advance directly to the main draw, those in groups numbered 11 to 22 compete in a preliminary round, the winners progress to the competition proper.